Finding the perfect Lo and Sons bag: What do you care to carry? Lo and Sons stepped up to the plate when no other designers sold fashionable, functional, and pocket-full bags. Their thoughtful designs have made the OG bag and OMG bag two of Big Apple Buddy's top-selling travel staples. In our review of the two styles, they both win. The only choice you'll have to make will be how much stuff you want to take on your adventures. If you're a fan of knit sweaters, you know you need that extra pair of sneakers, or you've got youngsters traveling alongside you, the Lo and Sons OG bag has all the space and purposefully-placed pockets you're looking for. The Huffington Post is understandably obsessed as well, with a review of Lo and Sons' overnight bags praising them as the best carry on bags out there. 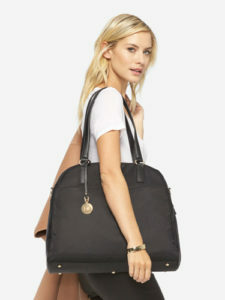 The Lo and Sons OMG bag, or "Overnight Medium Gym bag," is just like the OG, but smaller. MapHappy's review of the OMG bag gets into all the details of what this tiny tote can pack (to compare its specs with the OG bag, see the handy chart below). Both sizes come in a variety of wardrobe-pleasing colors, and both have Lo and Sons' signature luggage strap that makes foot travel through airports effortless. Take these bags from work, to yoga, to your weekend. Get them from Big Apple Buddy today! Unfortunately, the USA Lo and Sons online store does not currently offer international shipping. However, Big Apple Buddy, your personal shopper, can help you buy products direct from the official USA Lo and Sons online store and ship them to your doorstep, no matter where you are in the world. We offer international shipping to over 110 countries including Australia, Austria, Bahrain, Belgium,Brunei, Canada, Croatia, Denmark, Estonia, Finland, France, Germany, Hong Kong, Hungary, Indonesia, Ireland, Israel, Italy, Japan, Kenya, Kuwait, Lithuania, Macau, Malaysia, Maldives, Netherlands, New Zealand, Norway, Oman, Portugal, Saudi Arabia, Scotland, Singapore, Slovenia, South Africa, South Korea, Spain, Sweden, Switzerland, Taiwan, Thailand, the UAE and the UK. If you would like to buy from the USA Lo and Sons online store, simply get in touch and let us know which items you would like to order. We’ll get back to you with a free international shipping quote within 24 hours!